Because Joanne is a teacher, she has designed her patterns to be thorough and user-friendly as well as instructional by including different methods of construction in each pattern to help quilters acquire new skills or fine tune old ones. All of her patterns feature a full colour photograph and cutting charts for ease of use. Included are ample line graphics as well as clear text. No “quilt as desired” in these patterns! Patchwork Schoolhouse gives quilting suggestions and explains exactly how the featured quilt was quilted. In addition to the featured quilt, alternate sizes are diagramed with appropriate yardage requirements for further options. Most importantly, all Joanne’s patterns have been tested by quilters just like you! A traditional block, along with a variety of floral colours, turns this quilt into a lovely bouquet. Learn partial seaming techniques to expand your quilting repertoire! Flying Geese & HSTs together make a spectacular block. Add a pieced border to make this a one of a kind quilt. A great project to piece quickly for the holidays - make a set for you & a special friend. Explore a variety of techniques in this charming bouguet all wrapped up in an eye-catching on point set! This favorite pattern can be interpreted in a myriad of ways to make each quilt unique. 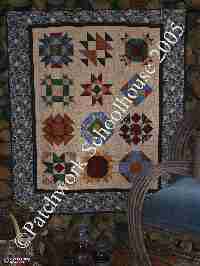 The pieced border makes this a real eye catcher! This lively little sampler quilt is a great way to use up all those HSTs you made watching Fun With Triangles or in class! By adding a few simple units together into Nine Patch blocks, this quilt takes shape quickly. Sashing & corner pinwheels finish the look. I really love making samplers! This one continues where Playtime left off. The quilt showcases a variety of blocks that build on the skills learned in More Fun With Triangles. 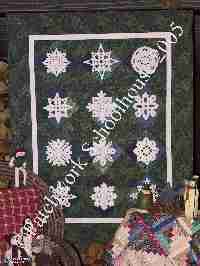 Each block uses quick piecing techniques to make them easy to put together. Simple stars set with sashing & a pieced border makes this great quilt look like anything but simple. Fast piecing techniques help speed the project along - simple! Remember how much fun it was to make paper snowflakes in grade school? Using the same idea, you can make a beautiful quilt using pre-made patterns or design your own! The techniques used to make this quilt 'one of a kind' are easy enough to create as a project with your kids. Fun for any "Snow Day"!